Jesus called all the followers together. Jesus said, "You know that the rulers of the non-Jewish people love to show their power over the people. And their important leaders love to use all their authority over the people. But it should not be that way with you. If one of you wants to become great, then he must serve you like a servant." Not among you! Jesus was dramatic and emphatic. It doesn't matter what the latest leadership trend may be! It doesn't matter what the culture around us dictates! It doesn't matter if that is not what we've seen! 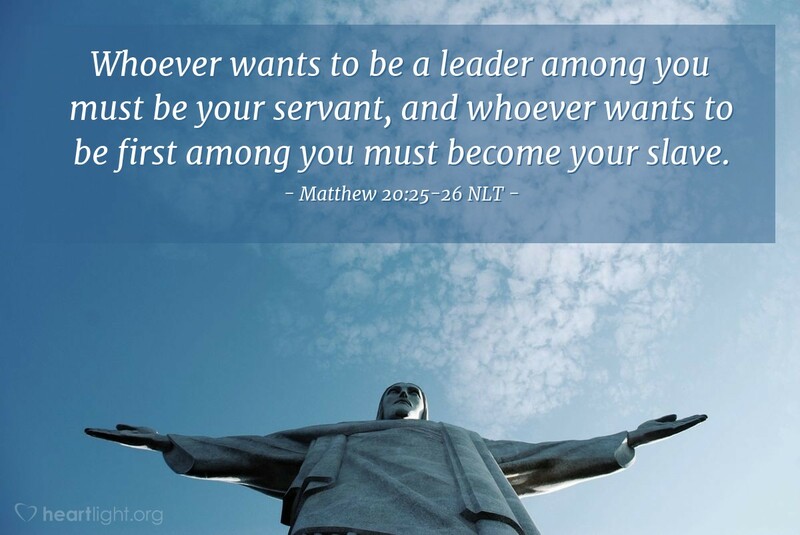 In Jesus' Kingdom, leaders are not bosses and leadership is not about exerting authority. Leadership is about service and example. Jesus' words are made even more powerful by his example. He doesn't just say it; he shows it in what he does to prepare his disciples for his death and how he goes to his death for them and for us. Holy and loving Almighty God, you have all power and might, yet you demonstrated your love and leadership in Jesus. I pray that you will pour out your Spirit upon us today, especially our leaders, so that we can have more leaders who display the character, courage, and charity of Jesus. I pray especially that you make me a more deligent and selfless servant. In Jesus' name I pray. Amen.